I decided this morning, day 14 of the Wildlife Trusts’ 30 Days’ Wild project, to try and capture on camera the roses in the garden, hung as they were with droplets left from the overnight rain. I’m reasonably pleased with the results and I found it an interesting exercise and one in which you could easily get engrossed, as usual, in trying to get the perfect picture! What I didn’t appreciate when I started out on the task was that I’d uncover an exciting story. 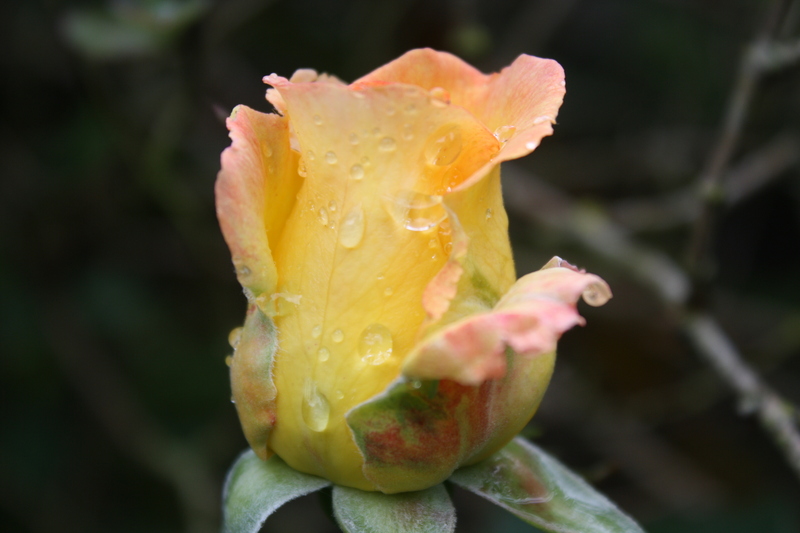 The first rose was in the front garden when we moved into the house, a few ahem, years ago! It is still going well, flowering every year and has a gentle scent, which is lovely. At present, it has some open blooms and several buds. A fully open flower, decorated with raindrops. 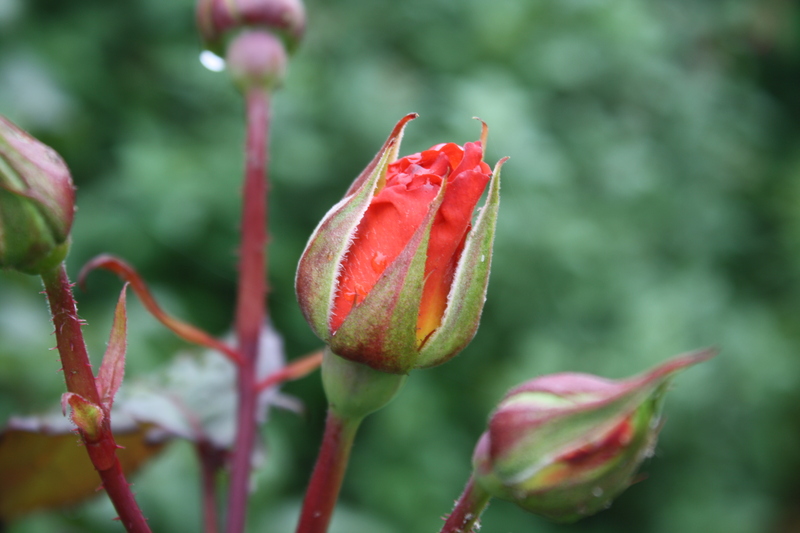 A bud just starting to open. The second rose is called Peace and my husband planted it in the back garden. It is a creamy colour but has not really got going this year yet, having just the one flower beginning to open. It is a rose with a dramatic story to tell. Peace is just beginning to flower. Peace is a hybrid tea rose with a gentle perfume developed by French horticulturalist, Francis Meilland, in the years just before WWII. Originally known as Rosa “Madame A. Meilland” in memory of Francis’s mother, it became known as Peace once the war had ended. Francis began developing the rose in 1935, but when in 1939, he foresaw the German invasion of France, he sent cuttings for protection to friends in Italy, Turkey, Germany and America. I discovered the remarkable story on Wikipedia, where it continues by reporting that the cutting dispatched to the USA went on the last available plane before Germany invaded France. Once in America, it was safely propagated by Conard Pyle Co. during the war. 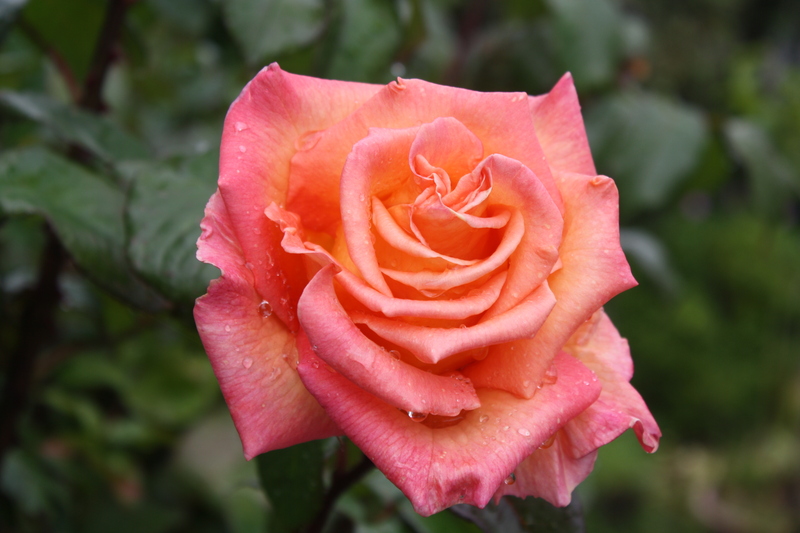 Considered to be an easy rose to grow, Peace has continued to be a popular variety throughout the world. In fact, according to Wikipedia, by 1992, over 100 million plants had been sold. 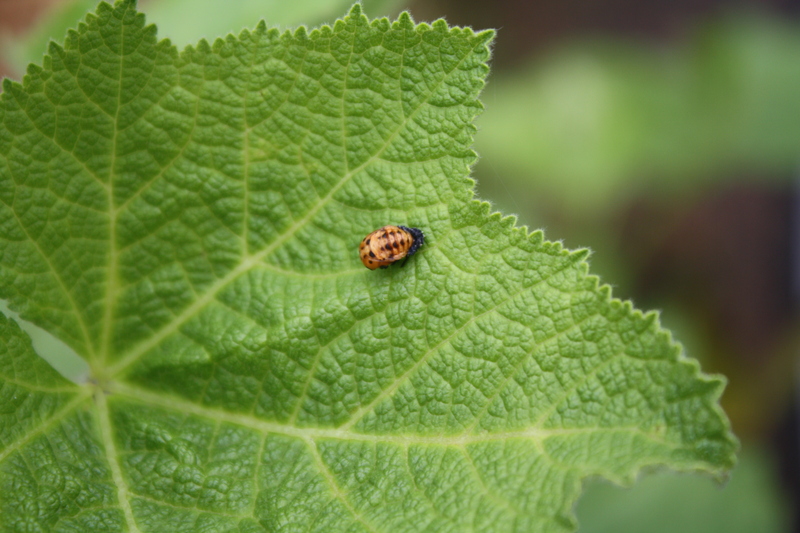 While I was in the front garden, I also noticed on a large hollyhock leaf what looks like a ladybird pupa. Two hollyhocks grew there last year and must have found the site to their taste because they seeded themselves all over it!